BACKGROUND: HIV remains a significant health problem in South Africa (SA). The development of apreventive vaccine offers promise as a means of addressing the epidemic, yet development of the human resource capacity to facilitate such research in SA is not being sustained. The HIV Vaccine Trials Network (HVTN) has responded by establishing South African/HVTN AIDS Early Stage Investigator Programme (SHAPe), a programme to identify, train and retain clinician scientists in HIV vaccine research in SA. METHODS: Individual interviews and focus groups were held and audio-recorded with 18 senior and junior research investigators, and medical doctors not involved in research. Recordings were transcribed, and data were coded and analysed. RESULTS: Findings highlighted the need for: (1) medical training programmes to include a greater focus on fostering interest and developing research skills, (2) a more clearly defined career pathway for individuals interested in clinical research, (3) an increase in programmes that coordinate and fund research, training and mentorship opportunities and (4) access to academic resources such as courses and libraries. Unstable funding sources and inadequate local funding support were identified as barriers to promoting HIV research careers. CONCLUSION: Expanding programmes that provide young investigators with funded research opportunities, mentoring, targeted training and professional development may help to build and sustain SA's next generation of HIV vaccine and prevention scientists. Several large-scale HIV vaccine, and other prevention, trials will begin in SA in 2016.3,4 These trials will utilise the strengths of South African investigative teams, requiring a wide breadth of research capacity. Whilst senior-level South African HIV vaccine researchers have developed enormous expertise, the number of junior clinician investigators entering the field has lagged. Since the early 1990s, SA has seen a decrease in the number of clinical researchers and an ageing of publishing scientists.5,6 A concerted effort is required to increase the number of young medical doctors entering the HIV prevention and vaccine field to ensure the country's ongoing contribution to this critical effort. In 2010, responding to the challenge, the HIV Vaccine Trials Network (HVTN), with support from the National Institute of Allergy and Infectious Diseases (NIAID) and the Fogarty International Center (FIC), established the South African/HVTN AIDS Early Stage Investigator Programme (SHAPe), a peer-reviewed medical doctors/PhD programme that recruits and supports young clinician investigators as they become independent investigators. Components of the programme, coordinated by the Desmond Tutu HIV Centre at the University of Cape Town, include 3-year salaried appointments at HVTN clinical trial sites; financial support for a mentored research project and research-related costs; targeted training and tuition for a concurrent PhD programme; travel to HVTN meetings and international HIV conferences; and facilitated integration into the HVTN scientific community via participation on scientific and governance committees. To inform the SHAPe programme and future efforts, formative research was conducted to: (1) understand facilitators and barriers to attracting, equipping and retaining young South African medical doctors in careers in HIV vaccine research, (2) develop recommendations to address identified challenges and (3) inform the design of clinician investigator development programmes, including SHAPe. During 2011, participants were recruited from clinical research sites and via referrals throughout SA. Target participants comprised a small group of specialised individuals and therefore purposive sampling with specific criteria was used. These groups were defined as: (1) senior investigators (SI) -those who led research teams and held the role of 'principal investigator' (PI) for at least 5 years, (2) junior investigators (JI) -those who had medical degrees and worked at clinical research sites for 10 years or less without assuming the role of PI and (3) young medical doctors (MD) - those who had received medical degrees no more than 12 years ago and expressed interest in research but had not pursued research careers. We used a qualitative approach and conducted semi-structured interviews and focus groups. K.B. underwent comprehensive training and utilised interview and focus group schedules to guide the sessions. Fifteen one-on-one, semi-structured, confidential telephone interviews were conducted, lasting approximately 1 hour and included five JIs, five SIs, and five MDs. Data collected during the interviews informed semi-structured questions used for three face-to-face focus groups, lasting approximately 1.5 hours and included four SIs, three JIs and four MDs in separate groups. All interviews and focus groups were conducted in English, recorded using a hand-held audio recorder, and transcribed in English. Demographics questionnaires were completed by those who participated in focus groups. All participants were over 18 years old and provided written informed consent. The study was approved by the University of Cape Town's Human Research Ethics Committee (IR File #128/2011) and the Fred Hutchison Cancer Research Center Institutional Review Board (IR File #7448). Participants (N = 18) were SIs (n = 5), JIs (n = 6), and MDs (n = 7). 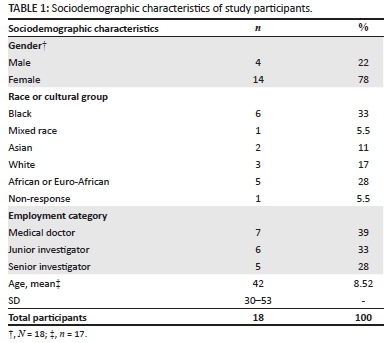 Sociodemographic characteristics of study participants are shown in Table 1. The following themes were identified for each research objective and were endorsed by participants from all groups (JI, SI, MD) unless otherwise stated. Suggestions for supporting these activities included providing students with small mentored research projects, offering stipends to support projects, and combining a medical degree with a master's or PhD degree. There was considerable overlap in themes identified as important for equipping and retaining doctors; therefore they are combined here. Skill building, infrastructure and academic resources: To effectively equip JIs, SIs noted that they need specialised training. Most participants highlighted the importance of acquiring research knowledge and skills through academic courses in '... epidemiology, statistics, immunology... ethics ... [and] research methods...' (SI). Some suggested courses in 'laboratory methods.' Most SIs recommended intensive training in manuscript and proposal writing and '[giving] presentations'. Participants also mentioned the importance of collecting data in the field and working in research units. Nearly all participants agreed that, to train and retain new investigators, the investigators need access to academic resources such as journal subscriptions, educational opportunities, research symposia and networking to foster 'collaboration ... [with a] wider scope of people (SI). Mentorship: Structured mentoring was raised by most participants as a significant facilitator to equipping, retaining and supporting career progression for new investigators. Despite the acknowledged importance of mentorship, most participants identified that lack of time hinders the mentoring process. All SIs emphasised that sufficient time for mentoring requires specific funding allocated for mentorship activities, but acknowledged the difficulty of earmarking research funding for mentorship. Participants were asked to reflect on the design of the SHAPe programme and comment on the strengths and weaknesses of this model, and provide input on ways to improve the programme. Participants suggested several ways to improve SHAPe. Most advocated greater involvement from SIs and JIs in publicising the programme and presenting research findings at medical schools and hospitals to increase interest in HIV vaccine research. Most participants agreed that the best recruitment approach is multi-pronged and includes 'personal outreach', 'national publicity' and advertising through the 'provincial Departments of Health', 'newspapers', 'major medical journals' and 'medical association websites'. A few participants also advocated use of social media such as Facebook (SI), direct SMS (MD) and email (MD). Some participants suggested expanding the programme to support independent research for mid-career HIV vaccine investigators. A few suggested increasing the number and location of sites where scholars can work. The present study identified factors influencing the attraction and retention of South African medical doctors into HIV prevention research; increasing the understanding of the resources and support needed to ensure their success; and eliciting suggestions to inform design of clinical research development programmes, such as SHAPe. Of note is that findings were largely applicable to HIV prevention research generally and clinical research more broadly, increasing their value and impact in informing recommendations and future practice. Overwhelmingly, there was recognition from all groups that research was not adequately represented in the medical training curriculum and that this limited exposure discouraged interest in, understanding of, and entrance into this field. The overall shortage of doctors in primary healthcare is critical in SA8,9,10 and requires urgent redress.11 As a result, medical education has renewed its focus on primary healthcare.12,13 Whilst necessary, this focus on primary healthcare has had a detrimental effect on the development of clinical research capacity and solid grounding in research skills12; and although medical schools may include training on evidence-based medicine, it is not prioritised as a critical part of the curriculum. A major barrier to the attraction, retention and career progression of doctors in research is the perceived lack of secured and ongoing funding. With limited financial support from the South African government and academic institutions, the large amounts of money required to conduct HIV prevention trials are sourced outside SA. This project-based funding is competitive, subject to exchange rate fluctuations, and often short-term and unstable. Based on these findings, several recommendations can be made. • Enhance academic research modules, and develop more programmes where students at all levels can gain hands-on experience to spark interest in clinical research, including HIV vaccine research. • Expand the number of programmes offering a combined MBBCh and PhD degree. • Foster an awareness of research, particularly HIV prevention research and its impact, amongst both medical professionals and the broader community. • Develop coordinated training programmes for HIV clinical researchers at all levels, as well as a structured mentorship programme supporting researchers vertically and horizontally. Provide training on effective mentoring for JIs and SIs. • Develop a more objective, standardised and clearly defined career development pathway for JIs with clear expectations, milestones and incentives (e.g. promotions, awards) and promote it widely. • Increase local/national funding (e.g. government, industry, corporate, donor). • Address funding allocation to support projects, the researcher and designated time for mentorship activities. • Ensure that salaries are comparable across research and clinical practice positions, and publicise this widely. in medical schools, registrar programmes, hospitals and conferences. Advertise in journals, social media, medical bulletins, SMS and email from trusted sources. • Create advancement opportunities for JIs. For example, create new PI roles at research sites, faculty positions and opportunities for independent research. • Incorporate JI development programmes in networks, universities and other collaborative research environments to leverage research and academic infrastructures. There are several limitations to the present study. The sample size was small, comprising 18 participants, most of whom took part in both one-on-one interviews and focus groups. Whilst this is considered an adequate sample size for qualitative research,14 it possibly limits the generalisability of the present results. However, notably two of the three groups included in this study (SIs and JIs) are, by definition, small in size. HIV vaccine research is a specialised field and it is partly because of the small number of doctors entering this field that the present research was conducted. Consequently, particularly for SIs, our sample included a significant proportion of the total SI population involved in HIV vaccine research in SA. In addition, given the small size of this research community in SA, it is possible that participants did not feel comfortable speaking freely and honestly, out of concern that they would be recognised, despite removal of identifiers. This risk might have been an issue particularly during focus groups, as many investigators are colleagues and collaborators. Nevertheless, all participants expressed an interest in and recognition of the importance of the topic, and were aware of the value of the research process, and it is hoped that this encouraged openness and honesty throughout. Finally, factors identified by participants as significant in attracting, equipping and retaining doctors in HIV prevention science research were largely representative of their own needs rather than a broader impression of what might be required overall. Whilst inevitable, this may be viewed as a limitation. We thank Michele Andrasik for her feedback on the manuscript and assistance with Atlas.ti., and Mindy Miner for editing the manuscript. This research was funded by the HVTN (NIH UM1 A1068614) supported by the National Institutes of Allergy and Infectious Disease, US National Institutes of Health, and in collaboration with the Desmond Tutu HIV Centre. D.F., J.K. and L.G.B. were part of the HIV Vaccine Trials Network that funded the present research. The authors declare that they have no financial or personal relationships which may have inappropriately influenced them in writing this article. D.F. (HIV Vaccine Trials Network) conceived the research study. D.F. and M.W. (Desmond Tutu Research Centre) were project leaders and led the qualitative study design, implementation, data analysis, interpretation and the writing of this article. D.F., M.W. and K.B. (Desmond Tutu Research Centre) coded transcripts. K.B. performed the interviews and led the focus groups, and assisted with data analysis and interpretation. L-G.B. (Desmond Tutu Research Centre) and J.K. (HIV Vaccine Trials Network) made conceptual contributions and provided edits to the manuscript. All authors contributed to the interpretation and writing of the article.